The Federal Reserve meeting is this week, and I expect that the Fed will continue its policy of hiking rates by at least 25 basis points a year. It is possible that the pace of rate hikes could quicken in 2017, but that is not saying a whole lot. None of this appears to be news to the bond market, given the post-election rise in yields. That said, the fact that the movements so far have been a mild bear-steepening would be normally interpreted as the market is discounting the Fed being somewhat behind the curve. As the chart above shows, although the selloff has been a brutal near-vertical line on a long-term chart, the magnitude of the move is still limited. It might be considered a 2/3 Fibonacci retracement of the post-"Taper Tantrum rally" (for those of you who believe in Fibonacci retracements). We are reaching the time of year for economists and strategists to publish their 2017 forecasts, and it looks like a good bet that there will be chorus saying that 2017 will be "The Big One" for the Treasury market. Although I normally snicker at such forecasts, I am definitely more open-minded this year. It may be that a change in fiscal policy settings could lead to the end of cycle rise in inflation that people have been forecasting since 2010. That said, I have increasing doubts that it will turn out that way. It should be noted that the steepening is not massive, but it would have been interesting for relative value traders since it was going against the grain of the forward rates. I would not want to extrapolate this this tendency for a bear steepening, as that is a popular pastime of lurid interest rate commentary penned by economists who know too much about interest rates to bother looking at things like time series data. The election results have done a number on deflation fears, with the 10-year breakeven inflation rate (above) rising near 2% again. That is still low relative to past history, but is closer to "normal." 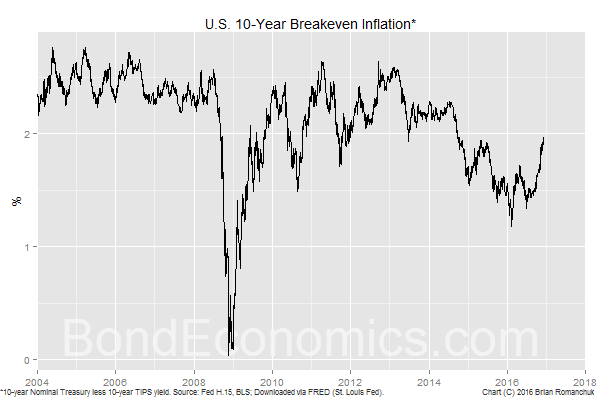 (Link to primer on breakeven inflation.) If there is any sign of synchronisation in the global economy, oil prices would presumably react, and there would be definite upside risk to breakeven inflation. This returns us to the Fed outlook. 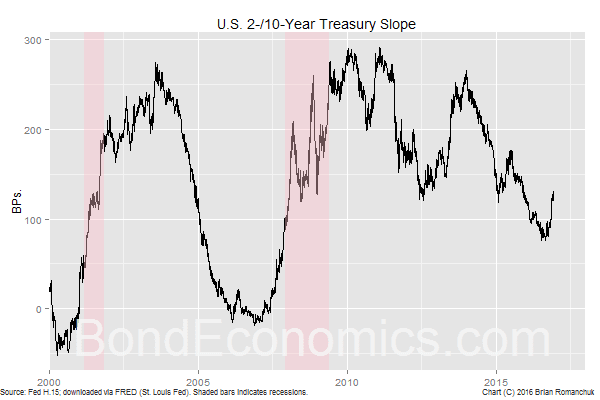 A bear steepening is consistent with the central bank falling behind the curve, but at the same time, we need to look at the magnitude of the movements, which are not very large. However, there is little need for the Fed to panic. It will take time for any fiscal stimulus to be implemented, and it seems likely that the Republicans will skew tax cuts to those who are already doing well. As I discussed in an earlier article, tax cuts aimed at entities with a low propensity to consume out of income will have a much lower impact per dollar of stimulus than stimulus aimed at those with a high propensity to consume. Furthermore, it is likely that Republicans will "pay for the tax cuts" by slashing programmes that they dislike, and what they cut may have a higher effective multiplier. That said, the Republicans may return to Reaganesque fiscal policy, and argue that tax cuts are self-financing (and/or will be paid for by future cuts to social programme spending). Until we have greater clarity on fiscal policy, we cannot hope to guess what will happen. 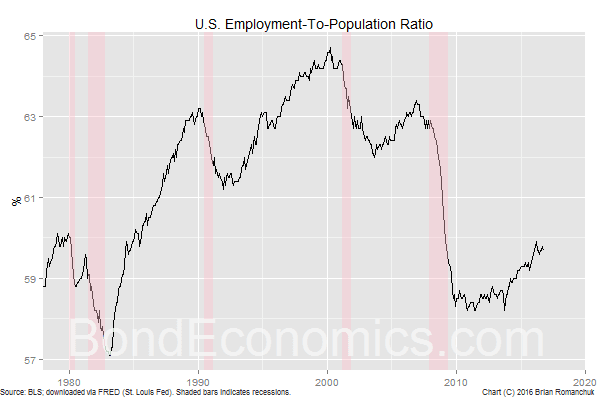 I see limited risk of the economy overheating otherwise, as I discount the value of the unemployment rate. The aggregate Labor Market Conditions Index (above) is showing little sign of life, while the employment-to-population ratio (below) is still well below the "normal" levels of previous expansions. The only reason to worry about inflationary risks is the result of the multi-tiered nature of the economy. Once we disaggregate the labour market by skill and location, there are wide disparities in the situation. Many rural areas are stuck in near-depression conditions, while some areas are doing well. If tax cuts are mainly aimed at the areas that are doing well, it could easily lead to localised inflationary pressures. That is, it will be much more expensive hiring people to take care of your yacht. Meanwhile, the Fed spends a lot more time talking to people with yachts than they do talking to those in rural areas. I still have my doubts that such pressures will greatly raise the overall core inflation rate above target in 2017 or even 2018, but it will generate anecdotes that will may fuel a more pro-active Fed. The days of Democrat-leaning economists worrying about a permanently negative "natural" real rate of interest are over. Don't understand the recent bond movement other than misguided anticipation. What happened to inflation as interest rates fell? Nothing. Why would we expect a slow hike in rates to do anything to inflation? The exception is where people borrow large sums to purchase (real estate, especially), but who wants deflation/stall in the housing market? 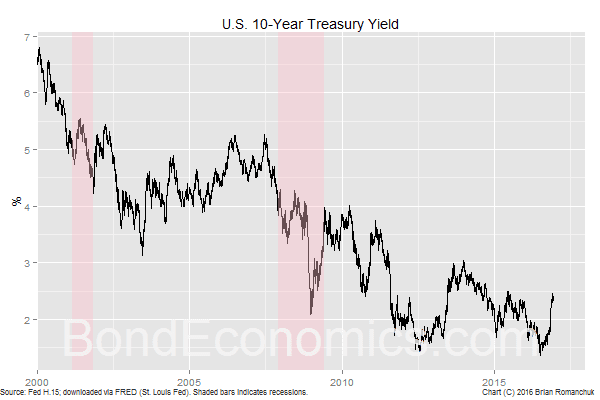 The Fed seems behind the curve, but not in the way that the bond market believes. Take a look at what's happened to credit demand lately: http://moslereconomics.com/2016/12/11/credit-check-17/ Things are slowing without any action by the Fed. At this point I don't think it's even clear that more income will necessarily lead to inflation. What are people going to buy more of for which demand can't be easily satisfied? Employers are (I hope) smart enough to realize that paying more to steal employees from the outfit down the street is self-defeating. I think before one can assume inflation, one needs to think through the transmission mechanism and it's not simple. If it were simple, all those help wanted signs in retail/service near me would be gone and all those positions would be full-time and paying $15/hr. I am not particularly worried about inflation, but hawks would argue that it tends to rise as the labour market tightens. Based on the unemployment rate, a lot of people would argue that we are near the so-called "full employment level" (a phrase that would cause most MMT economists to scream) that is associated with rising inflation. Bond yields are still quite low with respect to what people used to think were "neutral" levels, so many would argue that even with the recent rise, a low inflation environment is still priced in.